Wedding vows have been around for around 500 years. So it’s no wonder there are so many of them to choose from. But vows are supposed to be personal, something that will express to your soon-to-be spouse just how important they are to you. So, how do you choose the perfect vows for your big day? We’ve compiled 131 of the best wedding vows out there as well as information on how to make them work for YOU. If you are writing your own wedding vows, you may be surprised by just how challenging it can be! Fortunately, marriage has been around pretty much since the beginning of time, which means many have come before you in search of the perfect wedding vows. And because of this, there is tons of wisdom and advice on the topic of how to write wedding vows. Here are some of the top time-tested advice for writing marital vows that will inspire your love ‘til death do you part. If you need help writing wedding vows, a great first step is to do some research on what is already out there. We suggest reading vows from a variety of traditions and religions. Drawing from a wide range of styles will help you figure out what elements are important to you and provide a wonderful jumping off point for heartfelt and creative wedding vows that express how you truly feel. As you put pen to paper, be sure to reflect on your relationship. You don’t need to tell your entire love story in your vows (your guests will thank you for this!) but incorporating details that are important to you and your partner will make your vows extra meaningful. This reflection will also inspire you and (hopefully) put an end to any writer’s block that you may be experiencing. You will most likely find that the answers to these questions provide all the material that you need for earnest and heartfelt vows. One key element that should be included in all wedding vows is the promises that you want to make to your partner. According to the professional wedding photography studio, Tailored Fit Photography, wedding vows should also include a nod to the future, referencing relationship goals, shared dreams, and the elements of marriage that you are most looking forward to. Our ultimate tip for how to write wedding vows is to be true to yourself and make sure your vows sound like, well, YOU. It can be easy to get wrapped up in flowery language or a formal tone as you pen your vows, but ultimately, you want your vows to sound heartfelt and genuine. By sticking to your gut and not trying to be someone that you aren’t, your vows will naturally show your spouse your truest feelings. So now that you know the basics of how to write wedding vows, it is time to get inspired. Below we share 131 wedding vow examples that we absolutely adore. Whether you plan to stick with traditional wedding vows or are piecing together something completely outside of the box, the beauty of classic wedding vows is always a wonderful place to start for inspiration. Below are some of the most common traditional wedding vows from a variety of religious and cultural traditions around the world. If you’ve ever seen a classic wedding film or attended a traditional Protestant wedding ceremony, chances are these classic vows will ring a bell. In addition to this beautiful tradition, the Seven Blessings known as the Sheva Berakhot (below) are also recited during the ring exchange. “Blessed are You, Adonai, our God, Ruler of the universe, gladden the beloved companions as You gladdened Your creatures in the garden of Eden. Blessed are You, Adonai, Who gladdens this couple. Blessed are You, Adonai, our God, Ruler of the universe, Who created joy and gladness, loving couples, mirth, glad song, pleasure, delight, love, loving communities, peace, and companionship. Adonai, our God, let there soon be heard … the voice of the loving couple, the sound of their jubilance from their canopies and of the youths from their song-filled feasts. Blessed are You Who causes the couple to rejoice, one with the other. For brides and grooms being wed within the Catholic church, this classic vow is typically a part of the ceremony. This is another traditional vow that you have most likely heard before. In traditional Cherokee weddings, there is no exchange of wedding vows, however, the below blessing is read as a part of the ceremony. “I, _______ take you ______ to be my husband/wife, my partner in life and my one true love. I will cherish our friendship and love you today, tomorrow, and forever. In the Name of God, I , ______, take you, ______, to be my [wife/husband], to have and to hold from this day forward, for better, for worse, for richer, for poorer, in sickness and in health, to love and to cherish, until we are parted by death. This is my solemn vow. Similar to Cherokee tradition, an exchange of vows is not typically a part of the Apache wedding ceremony. However, the below blessing is included in ceremonies. The other traditional Baptist wedding vow is the short and to-the-point option below. Although vows are not typically a part of Muslim weddings, they are occasionally incorporated into the ceremony. Many orthodox ceremonies incorporate silent vows into the wedding ceremony. However, in the Russian Orthodox church, the below vows are typically spoken aloud. If you are a groom searching for the perfect wedding vows to show your partner just how much you really care, here are some of the most popular wedding vows for him. You can use these vows as they are or simply let them serve as inspiration as you are writing vows for her. 23. “Thank you for standing here with me today as we create the ultimate team for life. I will be by your side and always love who you are, as well as the person you will grow to be. I will work hard to understand your wishes, desires, fears, and dreams and will strive to make you happy. I will be there for you when you need me, whenever you need me, and I will support you through misfortune, and celebrate your triumphs. I will keep our lives exciting, adventurous, and full of passion. 25. “ ____, I love you. You are my best friend. Today I give myself to you in marriage. I promise to encourage and inspire you, to laugh with you, and to comfort you in times of sorrow and struggle. 26. “You have made me the happiest man on the world today by agreeing to share your life with me. I promise to care for you and protect you. I promise to comfort you and encourage you. Totally stumped on how to show your partner how much they mean to you? If so, here are some beloved and time-tested “vows for her,” which should serve as a jumping off point as you search for the perfect wedding vows. If serious and romantic isn’t your thing, don’t worry! Just because it is your wedding day, doesn’t mean you can’t be true to yourself — and your sense of humor. There are plenty of hilarious vows out there that will have your guests crying tears of joy. Here are a few of our favorite comedic standouts when it comes to funny wedding vows that are guaranteed to keep the mood light. If you are searching for modern vows that don’t come from a specific faith or culture, these non-traditional wedding vows may be exactly what you are looking for. These vows prove that just because you are bucking tradition, doesn’t mean your vows can’t be filled with romance and meaning. 56. “Whatever lies ahead, good or bad, we will face together. Distance may test us for a time, and time may tire us. But if we look to each other first, we will always see a friend. If you are a hopefully romantic on the hunt for passionate wedding vows that will truly express the way you feel on the inside, we have you covered. Below are some of the most romantic and emotional wedding vows that we’ve read to inspire you on your quest to show your one-true-love how much you really care. 68. “(Name), our miracle lies in the path we have chosen together. There is a reason TV and movie writers get paid the big bucks — their eloquence. So why not borrow inspiration from some of the most famous wedding vows and romantic quotes from television and movie history? “To love each other even when we hate each other. No running–ever. Nobody walks out no matter what happens. We’ll take care of each other even when we’re old and smelly and senile. For all of you bookworms out there, we have compiled some of the best literary quotes that can be used as wedding vows or to inspire you as you compose a masterpiece of your own. Nothing quite says “I love you” like a classic love ballad. If you find it easier to express yourself with music than words, you may enjoy drawing inspiration from these classic love tunes that work seamlessly as wedding vows. Or, if you feel like busting a move, you could try mixing it up with a full performance like this daring groom. How many bridges I’ve got to cross? ‘Fore I can talk to the boss? Won’t you be my forever woman? If you are curious to see some examples of totally unique, real-life wedding vows in action, this is the place for you. Below we include wedding vows from people just like you to inspire you to put pen to paper and make your love heard. If these real-life brides and grooms did it, how hard can it be? 106. “I could stand here and tell you how much I love you, but those words mean nothing unless they are shown through repeated little acts of devotion. I vow to celebrate with you when the Patriots win and blame Bill Belichik for everything when they lose. I vow to keep reminding you McDonald’s is unhealthy and to go get that mole checked because I want to live long, happy lives by each other’s side. 107. “I vow to be faithful in sickness and in health, during times of want and plenty. 108. “I pledge to love you, honor you and respect you every day (with patience, maturity and not a single ounce of ‘tude). I vow to protect you and our family — our little people — to the best of my ability. I will do whatever it takes to provide for us, even if that means teaching English or revamping Prettyboy Promotions and partying in bars five nights a week. I promise to be a good brother-in-law and exemplary son-in-law. 112. “I promise to pray with you, to dream with you, to build a family with you and to encourage you. I admire you. Simply because of your kind soul, tender heart, and positive mindset. I especially appreciate your endearing sense of humor. I am ever so grateful for your love and selflessness. In return, I offer these promises. I promise you my everlasting devotion, my loyalty, and my respect. I promise to love you unconditionally and to grow with you in mind, body, and spirit. I promise to pray with you, to dream with you, to build a family with you and to encourage you. I promise to share in your joys and sorrows and all that God has to offer us. 113. “James, to be honest, I feel like the most blessed girl in the world. I have not only found my life-long companion, the lover of my heart, but my soul mate. Thank you for standing by me and sticking with me through thick and thin; for seeing the person that’s before you now. James, you believed in me when I didn’t even believe in myself and for that, I love you so much. 117. “Rupal, since we met, loving you has been effortless, natural, and indescribable. We have grown over the years, and I promise to continue to grow with you. Your ambition inspires me. Your simplicity comforts me. You challenge me, and I know that I will challenge you. To love and fall more in love with you each day. To cherish every moment we have together. To respect and honour you for the rest of my life. To be open and honest with you. To support you in all your heart’s desires. To follow you wherever you may go. To make God the centre of our marriage and to push us into the things he has for us. 126. “I want to start by telling you how much I love you. Yes, I love how handsome you are, and how you’re cut like an action figure, but that’s just the icing on the cake. The absolute best part about you is your kind heart. You are the most giving, selfless person I know and I thank God every day that you have given all of your love to me, without any hesitation. 130. “I call upon my friends and family present here today, to witness that I love you. I promise to trust you, be honest with you, and always support you until our days should end. Did you find our vow examples helpful? Check out our wedding send off ideas article for inspiration for the perfect send off! Feeling inspired but aren’t sure where to start? This is actually more normal than you might think! Writing heartfelt wedding vows is a seriously daunting task — even for the most seasoned writers out there. 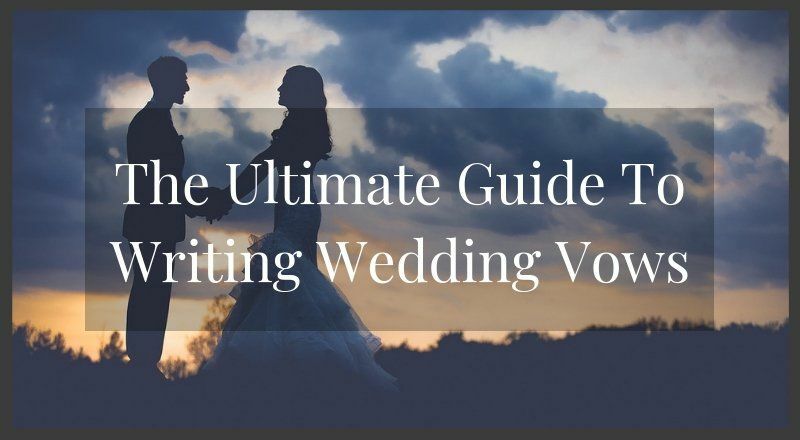 In our experience, one easy way to put an end to writer’s block and get the ball rolling on your vows is to follow a wedding vows template of four easy steps. Below, we outline these steps, that should make developing your own vows a breeze. The first element that should be included in your wedding vows is always a declaration of your love. This may sound intimidating, but it doesn’t have to be anything too grandiose. One of the best things about writing your own wedding vows is that they are totally unique to your relationship. So don’t be afraid to incorporate important elements of your relationship into your vows. Incorporating other important moments from your relationship such as pivotal moments, shared memories, or even your engagement story! Wedding vows are called vows because they include making promises to your partner, so no vows would be complete without some well thought out promises to your husband or wife to be. You may not be a psychic, but this doesn’t mean you can’t imagine what your future will look like with your partner as you grow old together. Want to get the wedding vows template mentioned here? DOWNLOAD NOW! So maybe it isn’t your first rodeo when it comes to wedding vows. Whether you are planning a vow renewal to reaffirm your commitment, to start your marriage out on a fresh page, or just because a vow renewal is a beautiful idea with a lot of meaning behind it. When it comes to wedding vows at a renewal, many couples choose to state similar vows to their originals. However, nothing is stopping you from creating a totally new set of vows. If you have decided to compose new wedding vows for your vow renewal ceremony, here are a few tips to keep in mind. What have you learned from your time being married? Be it five years, twenty years, or even fifty, you have definitely learned a thing or two about what marriage means to you over your time as husband and wife. Use this experience to inspire your vows. After many years together, you most certainly have some important memories and experiences that have shaped your marriage. Look back on these shared experiences, and share the stories that have been meaningful to you during your years of marriage. If you are a couple that has been together for many years, you most likely have reached quite a few milestones in your relationship. Some might include your engagement, your original wedding day, having children (or grandchildren! ), or buying a home! Incorporating these elements into your vow renewal will make it extra meaningful. Similarly to wedding vows, it is important to seek outside inspiration when it comes to vow renewals. This inspiration can include poetry, movies, songs, and reading different types of wedding vows. Seeking inspiration will help light the spark to create meaningful vows for your renewal ceremony. “My dearest love, as we stand here today, I think back to all the wonderful memories we have shared. There is no greater feeling in life than to have your best friend by your side every day. Though we have had our struggles, our love has been strong enough to conquer it all. I am thankful for you being in my life each and every day. You are more a man than I ever imagined could come into my life. You are confident, independent, caring, nurturing, and supportive. You make every day on earth a day worth waking up for. My wish today is that as we say these renewals you, my love, will once again say “I do” you are my world and my everything. For you, I give my heart, soul, body, and mind every second of every day. I take you today not only as my husband yet again, but as my best friend and lover, my confidant, my shoulder when I need to cry, and the person whose arms I could not picture being without. If you are planning your second wedding and are unsure where to start when it comes to your vows, you are not alone. You may have mixed feelings about the fact that you have been married before, feel that you need to downplay your previous marriage, or like your second wedding isn’t as important as your first one. However, finding love again is most definitely something to celebrate and be proud of and your second marriage vows should be just as meaningful (if not more meaningful!) than before. As with all wedding vows, it is also critical to seek inspiration from outside sources as you develop your totally unique wedding vows, and this means looking to sources like love poems, famous quotes, and, most importantly, examples of wedding vows. In addition to the 131 sample wedding vows that we shared above, here are a few lovely examples of second marriage vows done right. It doesn’t matter if it is your first time down the aisle, a vow renewal after many years together, or a second marriage with a fresh start — the love you are promising one another in your wedding vows is the reason you are coming together to celebrate. Finding the ultimate wedding vows varies for every couple. For some, sticking to traditional wedding vows that are rich in meaning is the perfect fit, while others may prefer to write their own from scratch or piece together vows from various sources of inspiration. No matter what you come up with, we are sure your vows will be filled with meaning and set a beautiful tone for your marriage. Are there any traditional vows we overlooked? Do you have any tips or advice on writing wedding vows?